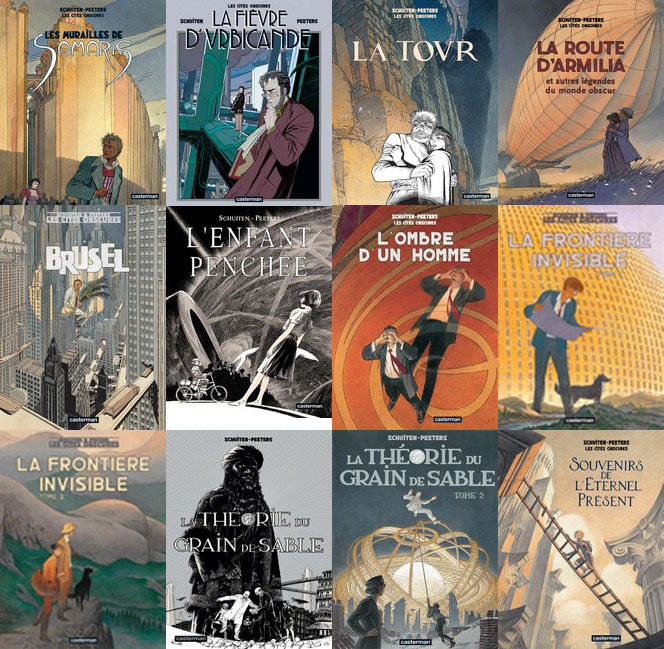 During the last years, many classic Belgium and French comic series were published in integral albums. Many people asked why Les Cités Obscures were not published in an integral version. In Japan the stories of Les Cités Obscures were published in some kind of integral version, but a French edition was lacking. Until now! Casterman will publish the Les Cités Obscures series in four integral albums over the next two years. The integral albums will collect several albums in one volume. There will be four volumes with newly created covers. The size of the albums will be more or less the same as the Japanse version, the order of the albums in the volumes will be different. The integral volumes will also have some unedited artwork. The first volume will be published later this year. Volume 2 in Spring 2018 and volume 3 end 2018 and the last volume in Spring 2019. After these four integral volumes of the Les Cités Obscures series, a fifth album is planned with the stories about “future cities”: Revoir Paris and Les Portes du Possible. The publication of the integral editions of Les Cités Obscures looks like the end of this series, but this might not be true according to Benoît Peeters. “I am still working on projects with François, like the McCay exhibition in Cherbourg. But a new story together has to wait until François has finished his project about Blake and Mortimer”. What kind of story they will make is still not decided. “A story about Les Cités Obscures is certainly not forbidden”. This blog post was created on 2017-05-01 at 13:23 and last modified on 2018-05-06 at 08:40 by Joseph Le Perdriel.